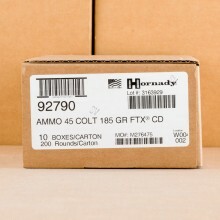 BULK 45 COLT AMMO WITH FREE SHIPPING AT AMMOMAN.COM! .45 Colt ammo started as a black powder cartridge that has roots going back to 1872. The U.S. military adopted the round in 1873 and held on to the caliber for just shy of 20 years. 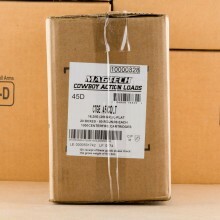 Today, you are most likely to find 45 Colt ammo being used by Cowboy Action shooters but it is also common for handgun hunters. 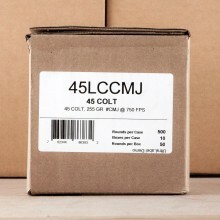 Known as 45 Colt or .45 Long Colt, both terms refer to the handgun caliber developed by the United States Army that is now primarily used by handgun hunters. 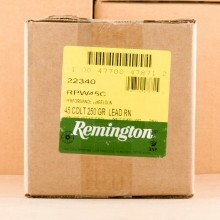 A rimmed cartridge that generally comes in bullet weights ranging anywhere from 200 grain to 250 grain with some specialty rounds even tipping the scales at 325 grain. 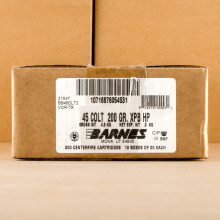 You’ll typically find 45 Colt ammo in-stock and available in lead round nose (LRN) cartridges. 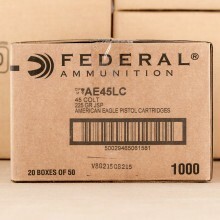 You can, however, also find reliable 45 LC ammo that with expanding bullets, jacketed hollow point (JHP) rounds that are sufficient for self defense. These rounds typically deliver muzzle velocity of about 900 feet per second. Standard factory loads today deliver about 400 foot-pounds of muzzle energy. A popular caliber among Cowboy Action Shooters, their preferred loads will travel significantly slower at around 750 feet per second. 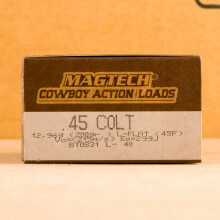 While 45LC is primarily a handgun round, Winchester and Marlin do make rifles with actions chambered for the 45 long colt round. Additionally, there are many .410 revolvers that are chambered to also accept .45 Colt. That makes the caliber a popular choice for shooters with a Taurus Judge or a Smith & Wesson Governor revolver. 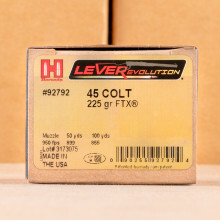 The 45 Long Colt cartridge wasn't the end of the line for this branch of the ammo evolution tree either. 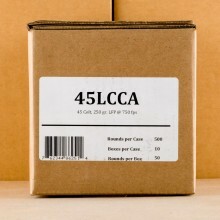 45lc ammo was the blueprint by which the 454 Casuall round was developed. 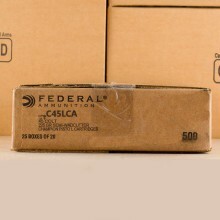 (The Casull round has a slightly longer and stronger case). It’s amazing that this round is still in wide use more than 140 years after its introduction to American shooters. That longevity alone suggests the cartridge is worthy of a trip to the range if you’ve never had the pleasure of handling a firearm chambered for the famed cartridge.